The ultimate Select Slalomvin, click here for select website, you can order these fins in every rake/lenght you like. I have tryed a 25/30/34 S07 M, and it is really a upgrade from the SL7. It works really nice with my Carbon Art boards, but I also like underneath the Fanatic Falcon. The S07 M can control diffcult conditions, this is because the lay-up is a bit more forgiving. However I never felt I lost any power, so the design is on the edge. 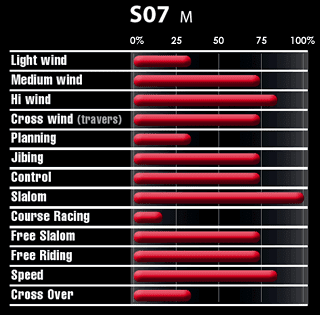 The SL7 is really close to his brother, when you are sailing on 100% flat spots the S07 M has no real advantage. But in chop this fin makes it easier to accelerate/control. Which mean in competition you are able to keep full throttle, instead of getting really tired. The last USM (ultimate speed meeting) I actually had with the S07 M 30cm the highest topspeed/ 10sec run out of all competitors. The difference was the easy handling, and I could keep up all day.